The outer signs of aging – wrinkling skin, graying hair, brittle nails – may be apparent, but the internal toll of time matters even more. Organs may not work as they once did, though that, too can be pretty obvious. What you may not have thought about are your cells, the microscopic basis for health. Cells contain "organs," too — some work like little brains, others like tiny bladders. Many of the maladies of old age stem from damage that accumulates at the cellular level, but because cells are so small, learning about how their organs operate can be tricky. This month, researchers at the University of Southern California revealed that certain cellular organs talk to one another by firing genetically encoded information back and forth. This dialogue — which went unnoticed for decades — appears to be important for cellular health, and may be linked to aging. The newfound messages stem from mitochondria, the bean-shape powerhouses that produce energy for the cell. The signal is picked up by the nucleus, the cell's brain-like command center that safeguards most of our DNA. When a cell is under stress – which in the study meant being underfed, but may extend to things like getting a sunburn – mitochondria can turn on certain genes in the nucleus to try to stabilize the cell, the scientists found. "Stress resistance is a hallmark of long-lived animals," said Changhan David Lee, who led the USC team that discovered the mitochondrial message, which they call MOTS-c. "If you are more resistant to stress, it's a good marker for extended lifespan." Lee, an assistant professor at USC's Leonard Davis School of Gerontology, is a consultant and shareholder in the biotech company Cohbar, which is seeking to develop medicines around these discoveries. There are many ways cells respond to stress, whether physical, chemical, or biological. But as we age, our cells' ability to respond to stress begins to slow. Defective mitochondria can produce devastating illness, including heart failure, muscle wasting, seizures, and strokes. Mutations in mitochondria have also been implicated in diabetes and neurodegenerative diseases. "A lot of aging is mitochondrial failure," said Marni Falk, head of the Mitochondrial Medicine Frontier Program at Children's Hospital of Philadelphia. In the new study, researchers starved lab-grown human cells and then looked to see how the mitochondria would respond. 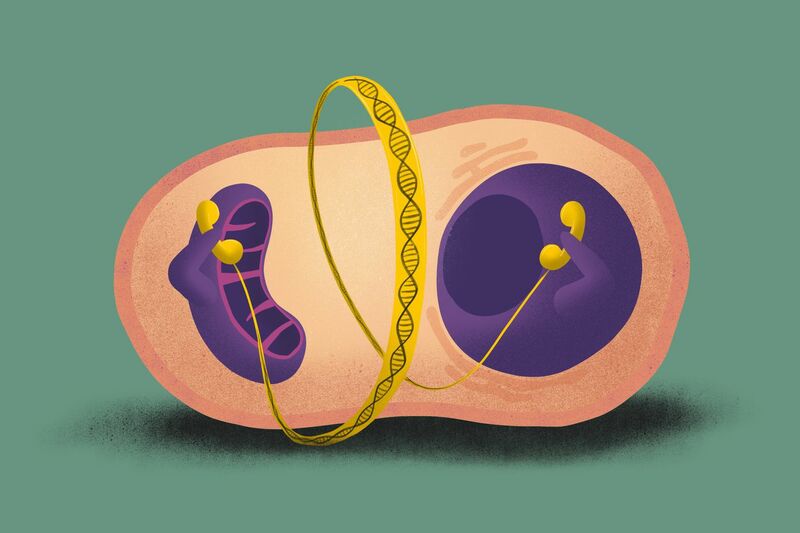 Using sophisticated microscopes, they were able to see a specific genetically encoded molecule move from the mitochondria into the nucleus over the course of 30 minutes. Once inside, a handful of genes known to be involved in protecting the cell from stress became activated. Lee's findings are all the more extraordinary given how young this field of research is. Early cell biologists – "early" as in mid-20th century – dismissed mitochondria as silent, specialized invaders of the cell, explained Gyorgy Hajnoczky, director of the MitoCare Center at Thomas Jefferson University. Scientists believe mitochondria originated as free-swimming bacteria that took up permanent residence inside other cells. The 1978 Nobel Prize in chemistry was awarded to British scientist Peter Mitchell for discovering how they pump out cellular energy, "and at that point it seemed like mitochondria were solved," said Hajnoczky. But modern tools for studying cells have unleashed a torrent of insights about what the trillions of mitochondria in our bodies are up to — and how they sometimes cause disease. "The field is exploding," said Falk. Scientists have now identified more than 300 genes linked to mitochondrial disease. "We knew of about a quarter as many 10 years ago," she said. Scientists were aware that mitochondria ooze important chemicals into the cell (that's a hot area of research that both Hajnoczky and Falk are studying), but Lee's discovery of genetically encoded mitochondrial messages marks the latest breakthrough. The new findings "are exciting," said Hajnoczky, who was not involved in the USC study. Yet he has reservations about the implications of this cellular cross-talk. "It seems it can do many, many different things — and that makes me worried," said Hajnoczky. In the past, Lee and his team have linked MOTS-c to obesity and insulin sensitivity, among other things. Hajnoczky's not convinced that all the claims about what MOTS-c can do in the body are proven, but the most recent discovery regarding stress, he said, is backed up by "very strong evidence."